We are very excited to be in Italy!!! 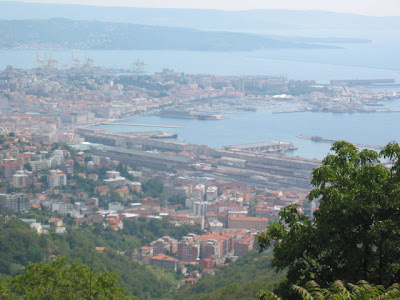 We have hit the 2000km mark now and when we got into Trieste we found our campground was set high above the city so we could look down on the city morning and night (see first photo) We spoke to some locals (our travellers Italian class is working) at the campground who actually have homes in the city but in the hottest part of summer they come up to campgrounds in the hills to sleep because the temp difference can be between 5-12° cooler up there. This next shot is for Bella - Trieste is a real scooter city!! (Italy is a scooter country from what we have seen) People were scootering around in business suits and casual gear, whatever. 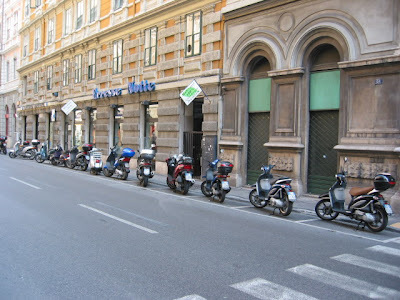 This is just an example of a small parking lot of scooters - there were many, many more. It was great to see them all lined up at traffic lights . 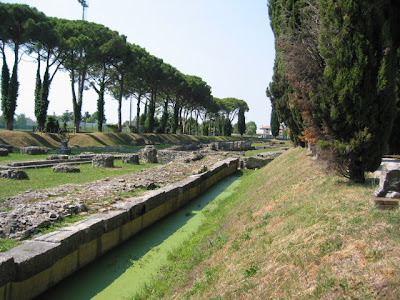 . .
We left Trieste after a day and headed to lovely Aquileia - one of the four main Roman cities. 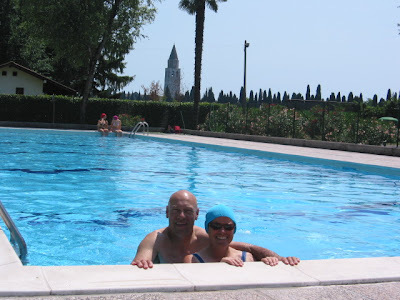 Our campground had this nice pool for some reason Carl wasn't required to wear a bathing cap. In the background you can see the tower from the Roman church in the town. The third photo was next to our campground - these are the remains of what was once the Roman port. 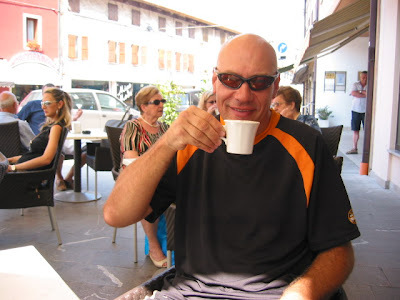 The last photo is Carl's first cappucino in Italy - we have been missing our Caffe L'Affare coffees.